The INTI Students Academic Conference (ISAC) originated as an annual intra-campus conference for IICP and has now been expanded to include students from across the INTI network. This year’s conference centres on participants’ research on the role and impact of education – and in particular, various academic fields – on national development. 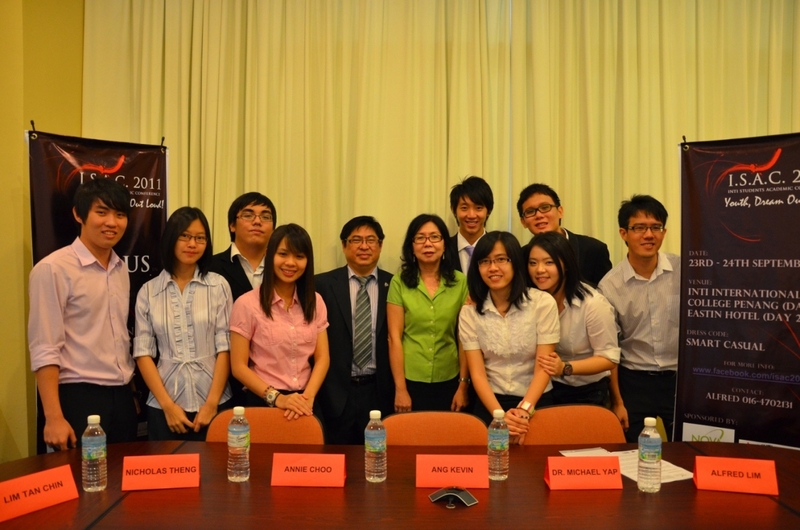 Members of the ISAC 2011 organising committee with Dr William Wong (5th from left). Participants are required to relate their findings with changes and improvements that can benefit future generations, while taking into consideration past achievements. Keynote speakers include Dr William Wong, Vice Principal of IICP who first mooted the idea for ISAC. “ISAC seeks to bring new frontiers to the education scene and instill awareness and a sense of responsibility among the youth today that national development is not solely the responsibility of the government but also of our future leaders,” said Dr Michael Yap, Principal of IICP. “21 papers have been submitted thus far and these papers illustrate the ways our future leaders can contribute to nation building through their chosen fields of study,” he added. The conference is not just creating excitement within the academic community but also among professionals in various fields. Nova Mulia Development has come on board as the main sponsor proving that the growth of future leaders and nation building are not only of interest to students and academia but also to organizations at large. “Research papers received thus far have come from four INTI campuses -INTI International University, INTI International College Penang, INTI College Sabah and INTI College Sarawak – and these students will be shortlisted and invited to present their papers at the conference. It is important for us to also begin a research tradition within the student community. With the generous contributions from our sponsors, we hope to engage a local hotel to host the conference,” said Ang Kevin, Organising Chairperson for ISAC 2011. ISAC 2011, which has “Youth, Dream Out Loud!” for theme, is a two-day conference to be held from September 23-24, 2011.